This old wife is the same as the hag of whom people were afraid in harvest (the last done with the shearing had to feed her till next harvest) and to whom boys bid defiance in their New Year day rhyme, viz., ‘the Famine, or Scarcity of the Farm’. In spring she was engaged with a hammer in keeping the grass under. but the grass grows too fast for her, and in despair she throws the hammer from her, and where it lighted no grass grows. Thilg i e fon chraoibh chruaidh chuilinn, Air nach do chinn gas feur no fionnadh riamh. 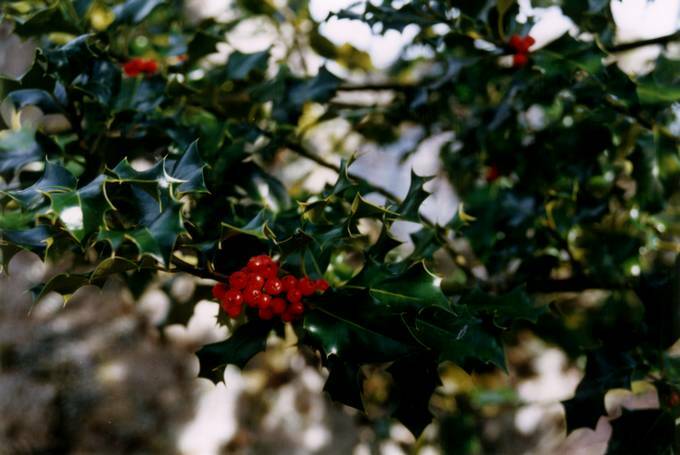 Holly (Ilex aquifolium) – In Gaelic, the name is Cuillean (Manx: Hollin). Its piercing spines and shiny evergreen leaves made it a tree associated with the Otherworld. ‘Bir’ in Old Irish means a ‘sharp point’ or ‘spear’ (eDiL). Some Manx people used to burn their Christmas holly wreaths and formerly the old harvest babbin on the fire at Easter. The legendary occupying ‘hag’ of Sliabh gCuillinn (Slieve Gullion) in St Patrick’s ‘home’ province Co. Armagh, Ulster, was called Cailleach Biorar in Nicholas O’Kearney’s in-depth account of the Irish goddess Aine, published in 1853 (Transactions of the Kilkenny Archaeological Society, Volumes 1-2, p.32). He translated this name as ‘Old woman of the waters’. On Slieve Gullion, her home was supposed to be the spectacular chambered cairn (the ‘South Cairn’), also known as ‘Cailleach Beara‘s House’, which gets a popular mention among writers about the goddess. This Cailleach Biorar, O’Kearney reminds us, also went by the name of Milucradh/Miluchradh and was described as a sister the goddess Aine and a main characterin the Fenian tale known as ‘Feis Tighe Chonáin Chinn Shléibhe’ (The Festivities of the house of Conan of Ceann-Slieve). This Fenian tale was derived from a relatively late copy in a post-MacPherson 18thC manuscript by a Waterford scribe named Foran, although there are fragments from manuscripts some 200 years older. It appears to contain some interesting detail as to the identity of Fionn, as well as the Cailleach Biorar or Milucradh. O’Kearney translated and published this in the journal of the Ossianic Society in 1855. There is a small lake at the top of Slieve Gullion near the cairns, but the Cailleach’s lake doesn’t just exist in the physical sense, being of fairy construction. The lough in the story almost appears to function with an opposite effect to the mystical subterranean wells of regeneration (Segais, Nechtain, Connla etc), associated elsewhere with Cailleach-related legends, sometimes involving capstones that are forgotten about (see later!). It was believed that rivers flowed eventually to the Otherworld, only to return mystically through chthonic wells in hills or sidhe places. These then manifested above ground as ‘holy wells’. What is the significance of Slieve Gullion? With the ‘coming of Patrick’ all of Ireland’s Cailleach sites (such as Cruachan Bri Eile etc) required a Christian female to replace the resident goddess, and to this end, Slieve Gullion acquired the services of St Moninne, daughter of ‘King Machta’. She was also known as Darerca of Cill Sliebhe Cuillin or Blathnaidh/Blinne and had a church/monastery at Kileavy (Cil Aoibhe) on the slopes of the mountain, the remains of which are still there to visit. Astute observers of names associated with the pagan goddess will immediately notice that ‘Mo-ninne’ might be a version of the character known in medieval Arthurian romances as Niniane, the ‘Lady of the Lake’. ‘St Ninian’ also appears as an important evangelist of the Irish Sea region in the early middle ages. Why Kileavy? It probably means ‘Beautiful Church’, but the other possibility is a church or religious house named after a founder other than Moninna: The name Aoife (Aoibhe or Aífe) is one much associated with the ‘fairy queen’ or ‘banshee’ in legends and placenames, particularly among the Dál gCais of Munster who called her ‘Aibell’ or ‘Aoibheal’ of Craig Liath – the name sounds like an epithet, of which the Gaelic goddess had as many as she had children. In literature, the early Irish tale Aided Óenfhir Aífe, Aífe (also sometimes spelled Aoife or Aoibhe) was the mother of Cuchullain’s tragic child Connla (‘Connla’s Well’ anyone? ), and in the Ulster Cycle tale Tochmairc Emire she is the opponent of Cu’s warrior-woman mentor Scáthach (another ‘epithet’ figure who, although given a Hebridean provenance in the TE, seems to be the same ‘peist’ character defeated by St Senan on the eponymous ‘Scattery’ Island in the mouth of the Shannon on the west coast). 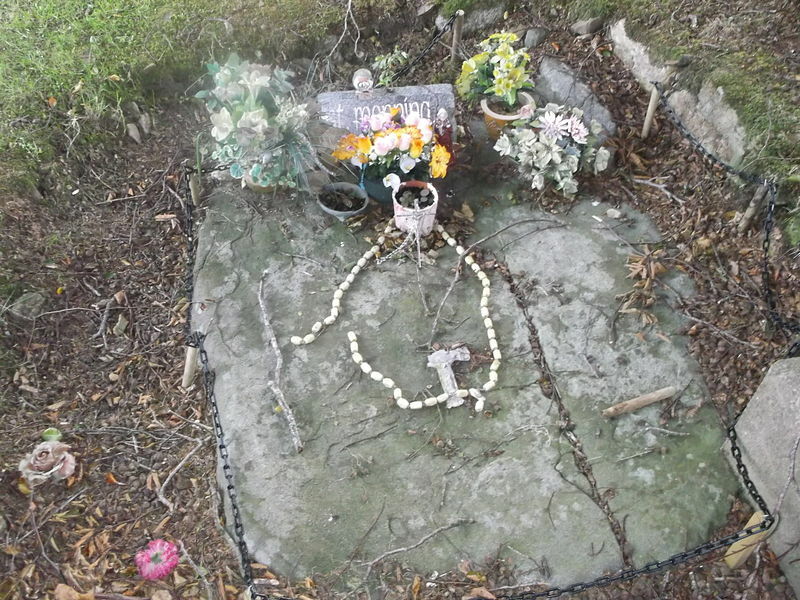 ‘Grave’ slab of Moninne at Kileavy, Slieve Gullion in Armagh. Another ‘Blathnaidh’ stone for the muse of poets? St Darerca of Ireland is another mysterious legendary holy woman who shares a name with Moninne – they are likely the same. This other Darerca is made to appear as a ‘great mother’ of many saints and bishops and was supposed to be Patrick’s ‘sister’ (Tripartite Life etc). Interestingly, her festival is celebrated at the Spring Equinox/Paddymas period (March 22) and she is claimed as the mother of St Mel, legendary purveyor of womens’ millinery goods. As well as gifting Brighid of Kildare with her veil, this curious hypostasis of Manannan (Mel – ‘Melinus’ in Jocelyn’s 12thC Vita Patriciae portrayal of Manannan, otherwise called ‘St. Maughold’) also managed to procure a miraculous fish which he supposedly ploughed up from a field, somewhat in the spirit of ‘The Voyage of Bran’! On the subject of galloping over water, ‘Darerca’ is credited in Brittany with being the mother of legendary King Gradlon! In the Breton legend, Gradlon married the sorceress ‘Malgven’ and was given a horse which could gallop on water (as if it were land) – his ‘evil’ daughter from their coupling was the Groac’h Ahes, Brittany’s answer to the Cailleach. ‘St. Malo’ was another Breton ‘Christian Manannan’. Is this blowing your mind yet? If the answer is ‘no’, then it is because you believe that hagiographies and church stories of early saints are ‘true’ and about ‘real people’. Otherwise, it may be because you believe that Ireland literally had many multiple gods and goddesses of which the medieval Christian scribes and poets told true accounts… The truth is somewhere else! 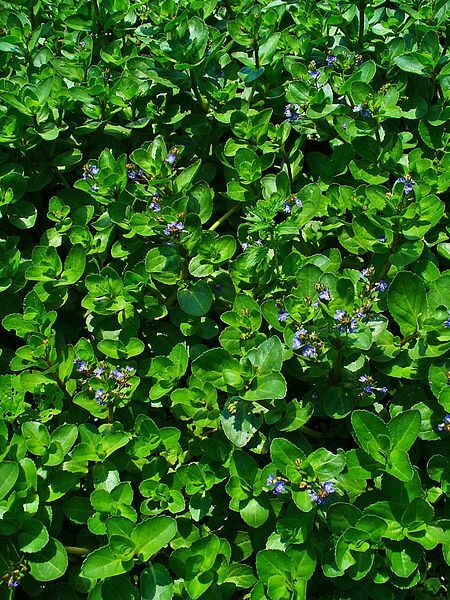 Also: Bearnán is a more modern word sometimes used to in the sense of ‘plant’. As can be seen, the words for pointed or penetrating things and for springs of water have a connected etymology in Gaelic. In springtime this meaning is deeply connected with the rebirth of nature, reforged underground and in hidden places as if by a magical smith or crafter. Shoots penetrate the ground to bring new life and the flood of springs and wells gush with new waters. 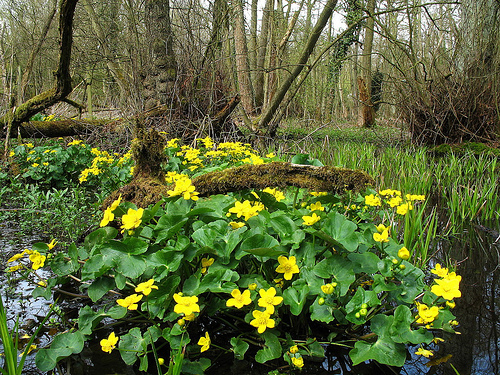 Pools in bogs are start to be perforated by reeds, rushes and magical plants representing this process such as the Caltha Palustris (Marsh Marigold, Kingcup, Bwillogh,as Bearnán Beltaine/Bhuide), the Menyanthes trifoliata (Bogbean, Bearnán lachan, Pónaire Chapaill), and the ubiquitous Veronica beccabunga (Brooklime, Biolar Mhuire, Biolar Uisce, Folacht (‘hidden’) etc) whose gaelic names – like that of the Bogbean – hint at the ancient mythological significance of these plants to water and regeneration in springtime and early summer in the Atlantic religion. 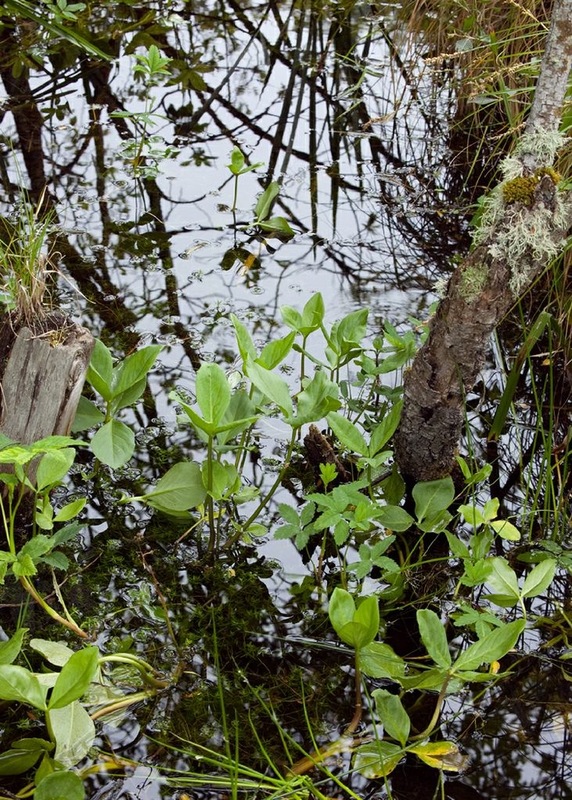 Menyanthes Trifoliata emerging from Curragh pool in springtime – reborn from water!